So, I’ve been a little out of it these days. 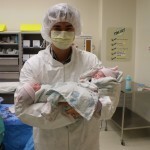 I thought that since the twins are going to be one month old this week, maybe I should update my blog about their arrival! 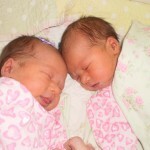 Our twin girls were born April 8th. And I have to say that I can’t believe I made it through the first month of twins! Of course I wouldn’t have been able to cope with anything without having my mom here to help out. 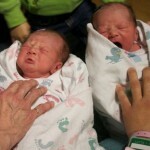 Life is insane with twin newborns and my other two munchkins running around! 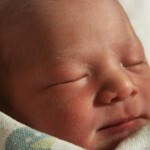 Ok, so for those of you who care and want to hear their birth story, here it goes. I went in for a routine non-stress test the day before I was to be induced. Baby B’s heartbeat was showing some variability, and so they thought it would be best to not wait until the next day to take me. So, a little unprepared I was, they escorted me to my room to start my labor. Mike was able to make it to the hospital soon after that, and we waited and waited for them to be able to hook me up to pitocin. My babies were positioned so low and so close together that they had a hard time getting two different heartrates on the monitor. And they couldn’t start me on pit until they had two different heart beats consistently for 20 minutes. So, we had to wait for my Dr. to make it over during his lunch break to break my water and insert an internal monitor on Baby A. Twenty minutes later they hooked me up to pit, and not long after that they gave me my epidural–it was great! I didn’t have to go through really hard contractions before I got it, which was SO NICE. And I didn’t realize how uncomfortable I was carrying those twins, even just laying in bed, until the epidural kicked in. I finally was able to lay down comfortably, for the first time in LONG time. Three hours from the time my Dr. broke my water and started me on pit, I was ready to push! They wheeled me into an operating room, which is precautionary with twin deliveries. 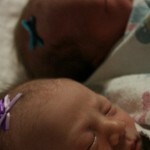 They were both head down and the first one came out at 4:27 pm, and the second one came out at 4:33 pm. 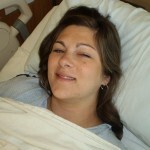 My epidural was amazing, and I had really a quite enjoyable labor experience! 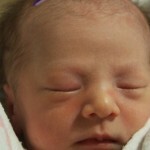 Baby A we named Lily, who was 5 lbs 12 oz, and Baby B we named Kate, who was 6 lbs 0 oz. 3 Responses to Welcome to the World, Lily and Kate! Oh. My. Gosh. They are BEAUTIFUL, CARLY!!!!!! Carly they are so darling! All of that hard work finally paid off:) Twins are amazing to me, how do they both fit inside? A miracle! Hope you’re getting a little rest.